Green Guru Appliance Recycling is the authority when it come to environmentally responsible disposal and recycling of appliances. We recycle microwaves, refrigerators, washing machines,dryers,stoves, range hoods and any appliance that plugs into the wall. When recycling appliances, remember that the reuse of precious materials is very important. It takes four times the energy to produce the raw materials gained from recycling. 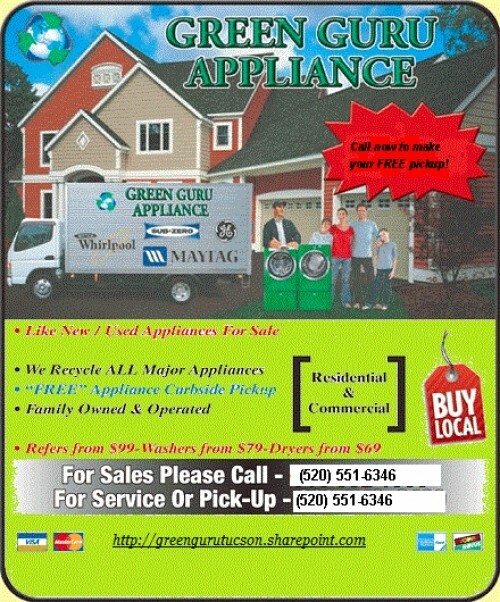 Green Guru Appliance Recycling offers Curbside Appliance Recycling and disposal for free. What do YOU do with your old washer, dryer, refrigerator, microwave or stove? Simple have it recycled! We offer curbside pick-up for all types of appliances and old A/C equipment at your home or business at no cost to you. Don't want to leave it on the curb, no problem we will collect it from your house or garage at no extra charge, no need to haul heavy equipment around, let us do the hard work. We collect old washers, dryers, stoves, microwaves, hot water heaters and A/C units to name a few, for a more extensive list of what we recycle please call. We make it easy by now offering fast over the phone appliance recycling scheduling . It is a simple 4 step process which takes less than 60 seconds to complete. Do not wait any longer call to schedule today and forget about it. We are willing to negotiate mutually beneficial arrangements with companies that want to recycle large quantities. We will dispatch a truck to your location (business or residential) to pick-up your Appliance to be recycled for free.